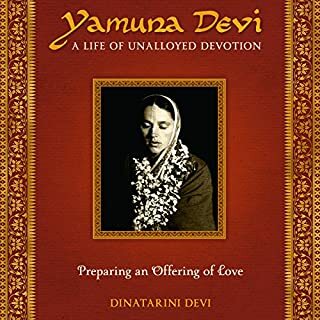 This memoir and biography unfolds the inspiring internal and external spiritual odyssey of Yamuna Devi's devotional life recalled in her memories, talks, journals, and writings as well as the remembrances of the author and other associates and friends. It is supplemented with relevant complimentary music and narrative featuring Yamuna. 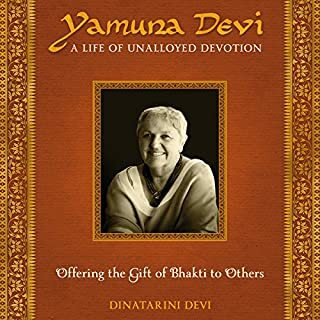 In Part One, Yamuna Devi meets her spiritual preceptor, Srila Prabhupada, at her sister's wedding in 1966 and begins her first tentative steps in Bhakti. In San Francisco she and a group of friends establish a vibrant temple and celebrate Rathayatra. Yamuna is initiated, married, and begins cooking for Srila Prabhupada. She, her husband, and two other couples then travel to London and ignite the fire of Sankirtan in England. Srimad Bhagavatam is the most prominent of the Puranas, or histories of the Ancient World. 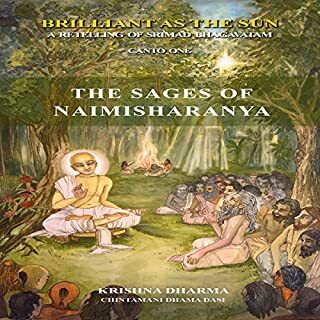 The original Sanskrit text of the work, penned by the great sage Vyasadeva, says it is "as brilliant as the sun", because its teachings can illuminate our consciousness even in the darkest times. Much like the Arabian Nights, it has an intricate structure of stories within stories; epic tales of divine incarnations, saints, sages, gods and earthly kings that span vast periods of time. 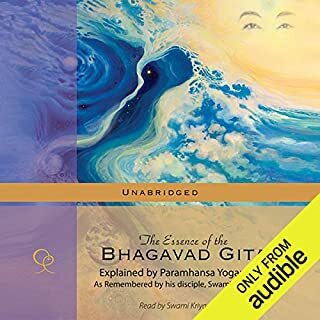 In this inspirational, spiritual, transcendent yogic arts audiobook, the very heart of bhakti, or devotional yoga, is revealed. 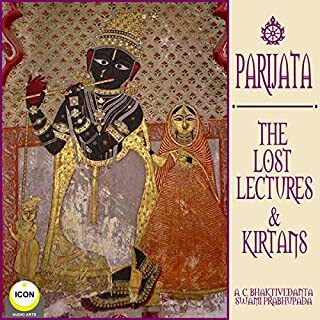 With two stirring philosophical purports by His Divine Grace A.C. Bhaktivedanta Swami Prabhupada, as well rare archival kirtans by the venerable, widely respected master - here is the perfect collection for every dedicated devotee or aspiring yogi. The Ramayana is one of the best-known epics in the world. 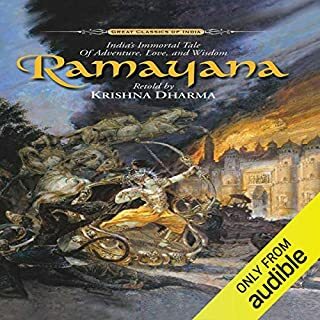 It is the tale of Rama, the Prince of Ayodhya, who exiles himself to the forest for 14 years to honor his father's Word. In the forest, Rama, his wife, Sita, and his brother, Lakshmana, meet new friends and unusual foes, and each day brings new adventures. But Ravana of Lanka, the King of Demons, ruins it all by abducting Sita. To rescue her, Rama enlists the help of Hanuman and his monkey army. 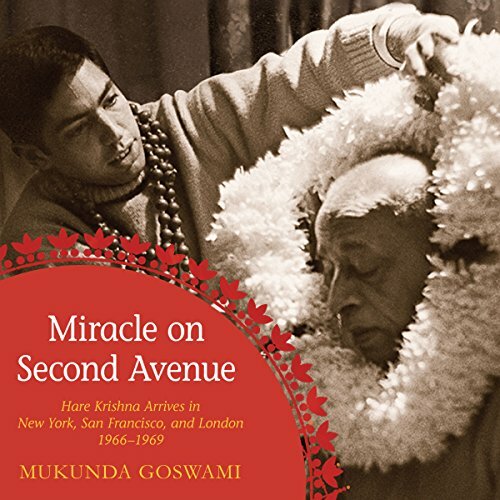 Miracle on Second Avenue is a short, carefully researched documentary book written in a you-are-there style that catalogs the start and growth of the Hare Krishna movement. Miracle on Second Avenue won the 2012 National Indie Excellence Award for Biography. 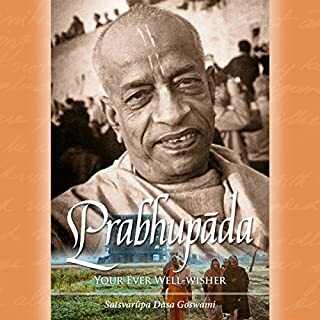 The work is a memoir of Mukunda Goswami, one of the pioneers of the religious group that is now known throughout the world formally as the International Society for Krishna Consciousness (ISKCON). Miracle is a series of historical events that include the movement's founder, A. C. Bhaktivedanta Swami, and his interactions on two continents with the author over the three-year period, from August 1966 until December 1969. 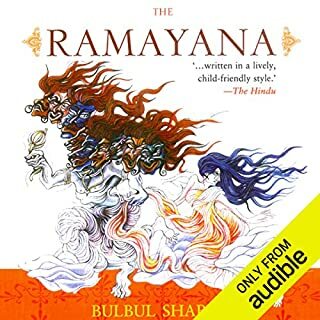 This is an awesome book and narration be Mukunda Goswami was just as brilliant. We really enjoyed the content and the delivery. I highly recommend this book. Good insights into the early days of the ISKCON movement. 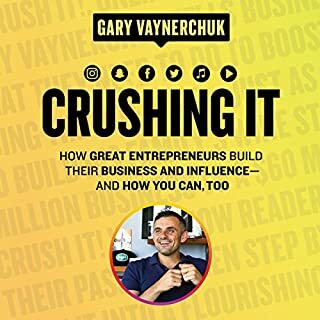 Thanks to all for this amazing book. the story was nice but the narrator was monotone, and sounded disinterested which made this a struggle to finish. the chapters were a bit choppy and seemed to end abruptly which made me revisit the app to ensure i was not missing any chapters. this feeling couldve also been a result of the narrators delivery. 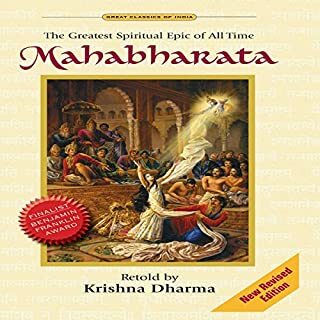 This is a beautifully written and narrated first hand view of Makunda Goswami and his role in starting ISKCON in the 1960's. 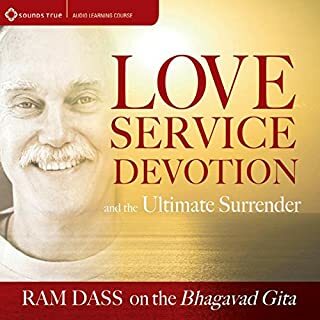 I fell in love with everyone in the book and have an even deeper understanding of A. C. Bhaktivedanta Swami Prabhupada and the profound love he had for the movement and his clear vision that he carried forth. 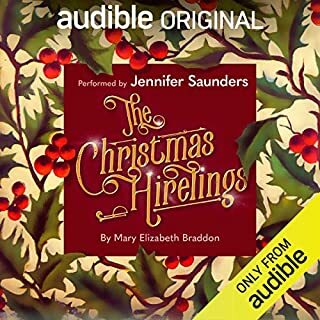 A wonderful read, I finished in a few days because I could not put it down.